A wave of collective ingenuity is sweeping across the world. Wave Innovation Exhibition is globally presented by BNP Paribas the global partner of TEB. After taking place in major cities like Paris, San Francisco and Milano, the exhibition was held in İstanbul by TEB. 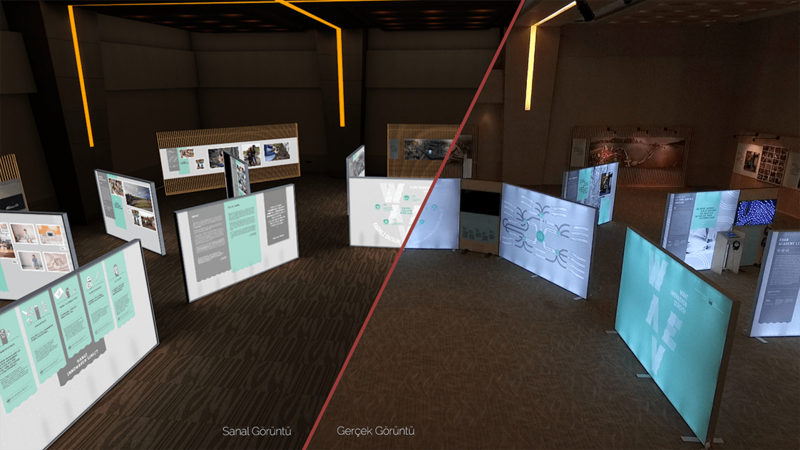 The VR project of the exhibition has been created based upon İstanbul exhibition to be experienced in Uludağ Economy Summit in Uludağ. To enrich virtual experience we have modelled and textured photo realistic 3D version of the exhibition hall. As seen on the comparison image, the hall has been modelled on a very detailed scale. The virtual reality experience concept for Wave Innovation Exhibition is developed and designed in a complex pipeline that consistent of many 3D programs in order to achieve the most accurate experience. Wave Exhibition VR project was experienced by users via virtual reality headset, gamepad and wireless headphones. Users could walk through the exhibition and get vocal information on each project in the exhibition. This extraordinary experience had excessive attention durint the summit.